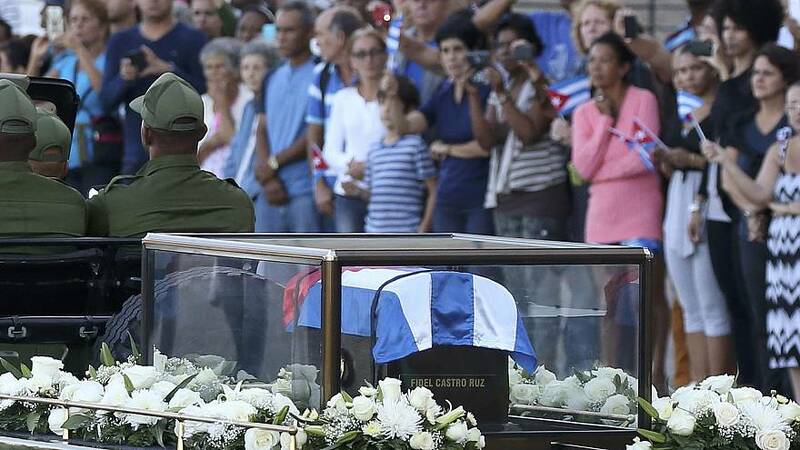 There were solemn scenes in Havana on Wednesday as a box containing the ashes of Fidel Castro – draped in the red, white and blue national flag – was placed on a trailer at the start of the revolutionary leader’s last journey across Cuba. Towed by a military jeep, the casket was driven through the streets of the capital where the people he ruled for half a century before handing over to his brother, turned out en masse to bid a fond, final farewell. This was the beginning of a 900 kilometre trek eastward over four days that will take the 90-year old’s remains to Santiago de Cuba where Sunday’s internment will mark the culmination of nine days of mourning. Leaders of major world powers have been noticeable by their absence in Cuba where Castro’s cortege is retracing the route – in reverse – taken by his revolutionaries in their victory march to the capital in 1959.